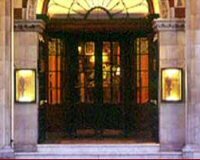 Description: This restaurant, now part of the Savoy, has one of the most renowned histories in London. It was once the site of the Fountain Tavern, home to the celebrated literary group the Kit-Cat Club, but was replaced by the Grand Cigar Divan by Samuel Reiss which opened in 1828. The Divan soon became a thriving coffee house, almost a club, among London gentlemen with members paying one guinea a year for use of the facilities. Patrons smoked, read their newspapers at leisure, and played chess while reclining on divans. Right from its early years the house was a popular recreational chess venue, and games of chess were even frequently played against other local coffee houses, with runners hired to deliver each move as it was made. In 1848, Reiss joined forces with the caterer John Simpson to expand the premises, renaming it 'Simpson's Grand Divan Tavern' which became an established attraction and patrons included Charles Dickens, William Gladstone, and Benjamin Disraeli. Almost all of the top chess players of the 19th century played there at some stage: Wilhelm Steinitz, Paul Morphy, Emmanuel Lasker, Johannes Zukertort (who had a fatal stroke while playing here), and Siegbert Tarrasch. It was in Simpson's in 1851 that one of the world's great games, the famous 'Immortal Game', was played between Adolf Anderssen and Lionel Kieseritzky. It also hosted the great tournaments of 1883 and 1899, and the first ever women's international in 1897. The advent of the automobile and the need to widen The Strand caused Simpson's to close temporarily in 1903 upon its acquisition by the Savoy Group, and upon its reopening a year later, renamed 'Simpson's-in-the-Strand', chess was no longer permitted on the site until September 2003, when a small tournament was held here. It was held to celebrate the 175th anniversary of chess on the site, and named after the unofficial world champion during the 1840s and 50s, Howard Staunton. One of the must-know places to find a lavatory in an emergency.